I say “primary premise” when perhaps I should say “an important concept which had a major impact on my paradigm”. I became satisfied at that point that “the autism spectrum” derived from a “black and white” distinction (albeit perhaps impossible to ever define or measure). So please know in advance that this will be a positive review and no critique or criticism is intended or implied!!! Despite one of this books “5 star reviews” on Amazon writers claiming to have read the book in two hours, and that they were looking forward to reading it again, I found it took me 3 days to read. One could perhaps partially attribute my taking so long to read a hundred and odd pages to my being a slow reader, or my different mental processing due to being autistic, or it COULD be because Dr Beardon’s book did precisely that which he intended it to do – it caused me to THINK! “Never believe anything you read about autism.” ??? Of course, when one goes on to read the following paragraphs, Dr Beardon reasons out WHY in this context the statement is not only reasonable but obvious, due to the total lack of homogeny we autistic folk appear to demonstrate. His introduction goes on to very clearly “set out his stall” or “set the stage” and express “where he’s coming from” (as he puts it). From my perspective, the very essence or heart of the book lies with its wish to instil the reader with the “desire to question”, or perhaps stimulate the reader to recognise the “need to question”. That is all well and good in principle, however for me it meant that even in the “Introduction” I would get through a couple of paragraphs, and find my Self having to stop reading and think about what I’d read! The 2nd of the 12 Chapters describes more of “what autism ain’t” than “what autism is”, presenting the misnomers, misconceptions, misunderstandings (“…Miss whatever-her-name is, and say I’m sorry” – SORRY, that’s a great line from an old Hothouse Flowers song that just came into my head!!!) which people have, and do, hold in their heads about autism. He goes on to “define autism” neurologically which I interpret as being a “distinction in thought processes”, and reaffirms my belief in the “you are or you’re not” model he convincingly argued during his presentation “Exploding the Myths of Autism” which I had witnessed. The 3rd chapter on social relationships provides numerous examples of how situations can be both interpreted and experienced very differently by what Luke refers to as “PNT’s”, Predominantly Neuro-Typical compared to the “Autistic Person”… or should that be “Person with Autism”… Dr Beardon’s Introduction introduced to me the apparent reality that there was a “person first” debate within the autistic community?!? I confess this was a shock to me and I had to stop and think about it! I remember discussing with Luke my own “problem” with the word “Identity” and it’s derivatives (due to my own “cultural biases” and environmental conditioning I guess) and my preference for “category”, however there appear to be a contingency who take offence at being “categorised” (I wonder if they are also part of the “first person” brigade?!? <chuckle>). This may only appear as a “semantic issue” to some, but for me personally (and I am perhaps “close to being alone” in thinking this), there is a notion of “you are identified by what you identify with”, and that is not the same as a “pigeon hole” category used for the purposes of recognition. 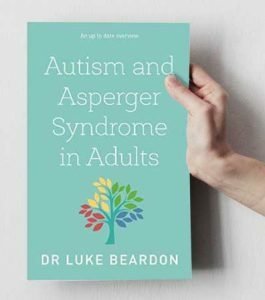 Out of all the amazing information and insight “Autism and Asperger Syndrome in Adults” contains, I feel guilty that I can’t provide anyone reading this review with a brief synopsis and overview, but I also realise that I would be aiming for the impossible and doing a disservice to Dr Beardon, defeating the whole purpose of the book (from my perspective of course!). If you are autistic, you may feel like the book has been written directly towards you at times, whilst if you are “Normal” – sorry, a PNT – then Dr Beardon’s gathering of data and experience over decades may assist one into, what appears to me, a genuine insight of the “autistic mindset”. I fully intend to rate this book 5 stars on Amazon (when the copies I ordered from there for my mother and sister have arrived!!!). Amazing review, thank you so – so – much.